Thank you for your kind words on my PCOS news. You are all the best! You have made this news so much easier to accept and it helps knowing there are so many others out there going through such similar things. Misery loves company, right? 😉 I’m kidding! I do really and truly believe attitude is everything and I am not going to let this slow me down or define me! If you know me, you know I LOVE Mexican food. And I get a little excited about Cinco de Mayo! Unfortunately, this year’s Cinco meal was a bit of a disappointment. The enchiladas were good, but they weren’t the best. 🙁 I spent about an hour on Tuesday night making the sauce and cooking and shredding the chicken and another 40 minutes last night assembling the meal. A bit tedious! And not as good as these enchiladas! Heat 1 tablespoon oil in a large ovenproof skillet over medium-high heat. Add chicken to pan; sauté 6 minutes on each side. Place skillet in oven; bake at 375° for 10 minutes or until done. Remove chicken from pan; let stand 15 minutes. Shred the breasts.Place chicken in a medium bowl; stir in cream cheese, 2 tablespoons cilantro, 1/4 teaspoon salt, and 1/4 teaspoon black pepper. Heat a medium saucepan over medium-high heat. Add remaining 1 tablespoon oil to pan, and swirl to coat. Add onion, and sauté for 5 minutes or until tender, stirring occasionally. Add garlic; sauté for 30 seconds, stirring constantly. Remove 3 tablespoons onion mixture; add to chicken. Add chili powder, red pepper, and cumin to remaining onion mixture in pan; sauté 30 seconds, stirring constantly. Stir in chicken broth, 3/4 cup water, and tomatoes; bring to a boil. Tear 1 tortilla into small pieces; add to tomato mixture. Reduce heat to medium, and simmer 30 minutes, stirring occasionally. Remove from heat; let stand 10 minutes. Carefully pour tomato mixture into a blender, and process until smooth. 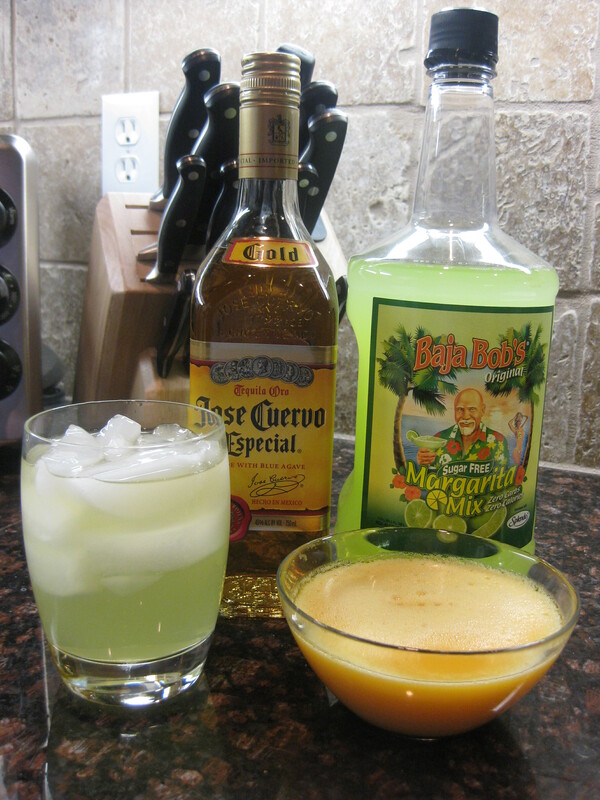 And we had some sugar-free Baja Bob’s almost virgin margaritas last night! And some flan too! Mmmm! I looooooooove Mexican food! But not Tex-Mex, the real deal! Toothpaste? Spicy? Hehe, silly husband! I love Mexican, too. What I pick depends on where I’m eating it. At home, I like tacos. But at a restaurant I prefer fajitas. I think it has to do with side items and the ability to build my own food. Have a nice one, Nicole! I love it all but don’t get to eat too much up here. When we make it at home I usually go for a burrito as you can load all the taco stuff up with lots of hot sauce and it’s not as messy when you eat it. PS: Everyone pretty much covered everything I was thinking about your diagnosis. Hope everything works out well enough down the road. B. I was driving all day yesterday when you posted your PCOS news, but I just want to tell you how much I KNOW you’re going to stay strong and rise above this!!! You have the support of so many people!! I can’t imagine how hard this must be, but know that you have a community of women (and men!) behind you on it! Enchiladas! I always think I’ll order something else but end up with enchiladas :). I love *good* fish tacos, like the kind you can get in Cabo. Mmmm. 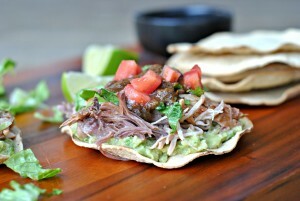 For dining out here or making at home, I love some simple chips and guac or a fancy quesadilla. The hubs loves chillies rellanos but I haven’t figured out how to make those yet! Cheese tamales with salsa verde. I get them at Trader Joe’s. I know frozen food isn’t supposed to be better than fresh but I’ve never had a better tamale than those. My god are they tasty. 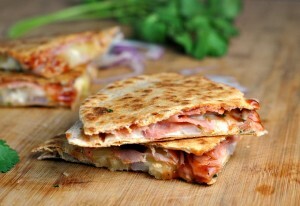 Sorry the enchilladas weren’t so great….I’ve had the ones you made previously and they seriously ROCK! Those are going to be hard to beat, for sure. Enchilladas are definitely my favorite! I would pick enchiladas, hands down. Probably the worse for you but the red sauce, salsa verde, and mole are such fabulous varieties! I love Mexican food too!! Usually my husband and I split fajitas but if we are ordering our own meals..then I am with you…Tacos rule!! they looked amazing, so sorry that they didn’t live up to the photos!! I love enchiladas!! But I also love fajitas, and feel they are a lot quicker to make. This keeps enchiladas as a special treat! 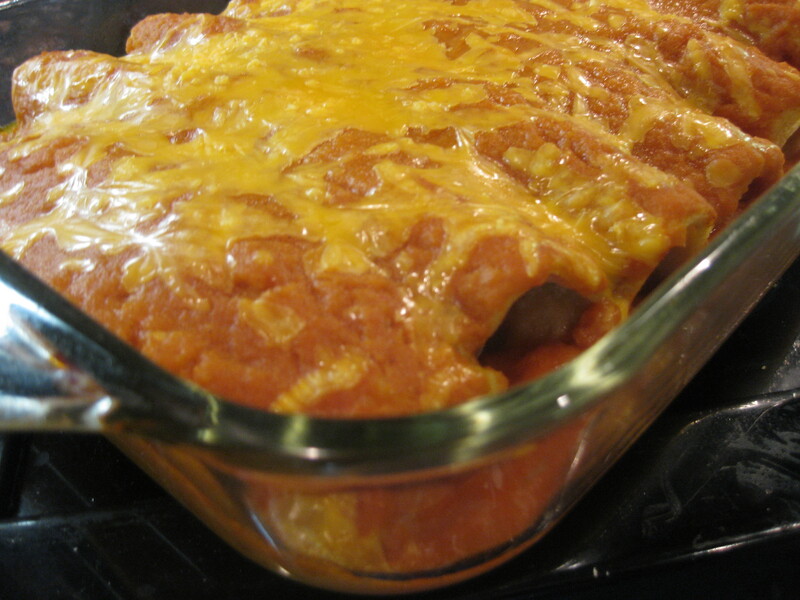 Well, the enchiladas look great even if you didn’t think they were the best. So sorry about the diagnosis but at least the Doc is offering positive feedback. Good luck in tackling this new issue. Thoughts are with you. You cannot go wrong with enchilladas my friend! So much work for a non knockout, bummer! I’d go for tacos. I love being able to pick and choose what goes it in and the veggies are usually uncooked whereas with fajitas they lose some of the great veggie crunch. 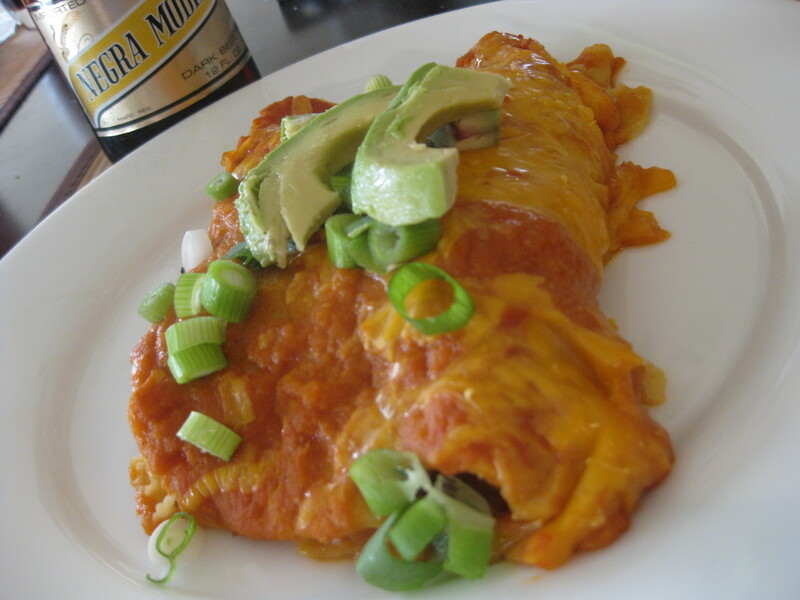 Those enchiladas look amazing…to bad they don’t taste as good as they look! Im a fajita girl! I always say Im going to order something different and I always wind up getting chicken fajitas. Theyre just SO good!! I like your Negra Modelo in the background. Every time I go out for mexican I get the same taco/enchilada combo with rice & beans. From the taco truck it is a Carne Asada burrito for sure! I shall say a little prayer for you and your PCOS–you’ll manage quite well I am sure, you have a fantastic attitude! I am sorry yours didn’t turn out better. I love enchiladas and tacos. We did margaritas too. love love love mexican food!! Enchiladas are great no matter what they look like! My favorite to make at home is naked burritos, but at a restaurant I typically order fajitas! YUM! These look fantastic. I prefer fajitas, only because I CONTROL what goes in them, and I can eat less of the floury tortillas and be perfectly satisfied! Have a nice weekend Nicole.